For the Girls weekend, parking will be permitted at Darice Fields starting on Friday at 5:00 pm. 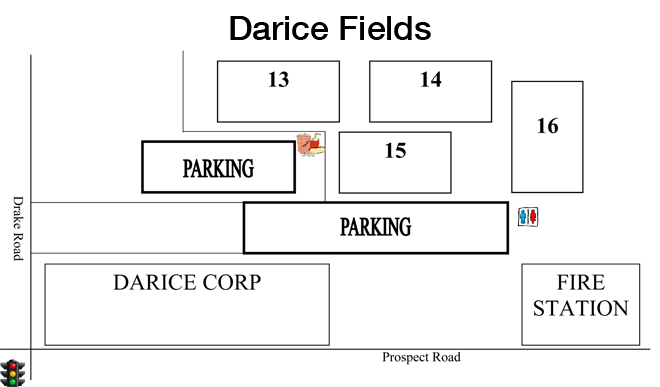 Prior to 5:00 pm on Friday, players can be dropped off in the Darice parking lot, but drivers will need to park at the church across the street. South (left) on Foltz Industrial Parkway for 0.9 miles to Drake Road. Left on Drake Rd., then 0.5 miles to the parking lot on left. The fields are at the back of the parking area. West (left out of parking lot) on Lunn 0.6 miles to Prospect. Left on Prospect 1.0 miles to Drake Road. Right on Drake less than 0.1 miles to first parking lot on right – fields at back of parking area. North (left) on Columbia Road 3.3 miles to Center Road (303). Right on Center Road (303) 3.2 miles to Substation Road. Left on Substation 2.6 miles to Boston Road. Right on Boston 0.1 miles to Prospect Road. Left on Drake < 0.1 miles to parking lot on right. Fields at back of parking area.